Collects and organizes the world into lists of sets and subsets, such as atmospheric layers, climate zones, Jupiter's satellites, Dante's levels of Hell, the Braille alphabet, US Army and Navy rankings, and even what all those numbers mean at the bottom of bank checks. 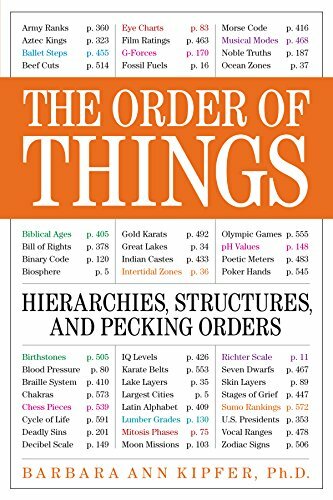 "The Order of Things" collects and organizes the world into succinct, easy-to-read lists of sets and subsets, such as atmospheric layers, climate zones, Jupiter's satellites, Dante's levels of Hell, the Braille alphabet, U.S. Army and Navy rankings, and even what all those numbers mean at the bottom of bank checks. It's both a quick reference and an invaluable source for trivia nuts - with chapters on earth, life, and physical sciences; technology; mathematics & measurements; religion; world leaders; society & social institutions; business & economics; the arts; domestic life; sports & recreation; and general knowledge & philosophy. Never overwhelming, always charming, this isn't just another reference book, it's the reference book.